This piece is for sale, in stock for immediate delivery. Scroll down for purchasing information. This carving is based on the left hand door panel of the Byrdcliffe linen press. The original linen press is in the Metropolitan Museum in New York and I built my reproduction about 10 years ago. (My wife won’t let me sell ours, but if you’re interested in commissioning the cabinet, send me an e-mail). This carving is adapted from the original door panel, it is slightly narrower. 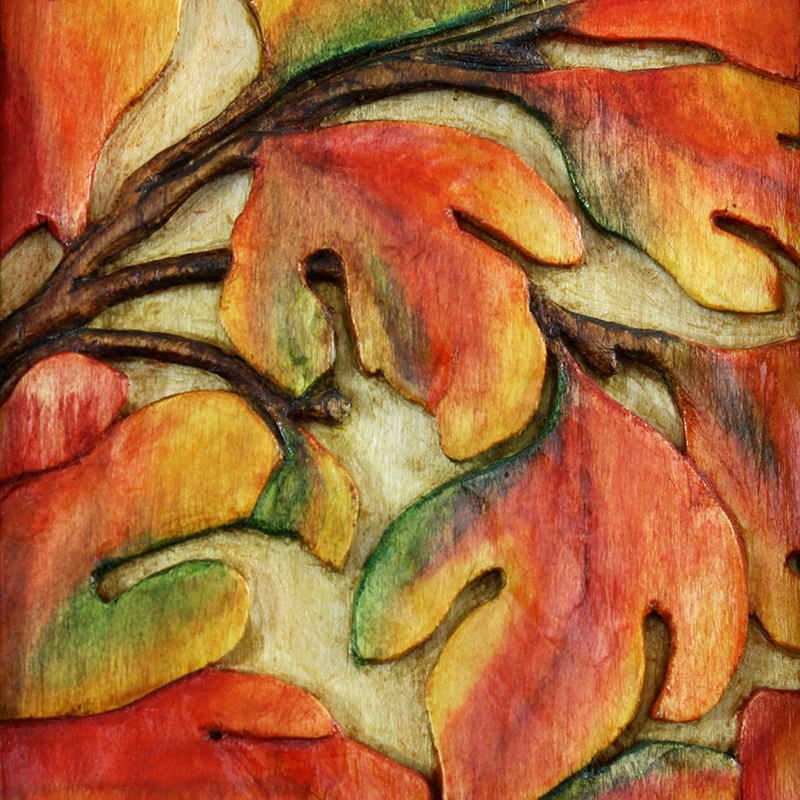 The panel is hand carved from solid basswood and colored with light-fast watercolors. The frame is solid curly maple, stained with aniline dye. Both the frame and the carved panel are sealed with shellac and top-coated with lacquer. The Byrdcliffe colony was located just outside Woodstock, New York and the design of the panels is by Edna Walker. Furniture was made at the colony for only a few years, and the addition of carved or painted panels adds to the nicely proportioned furniture. I’ve been smitten by these pieces, especially the work of Walker and of Zulma Steele. 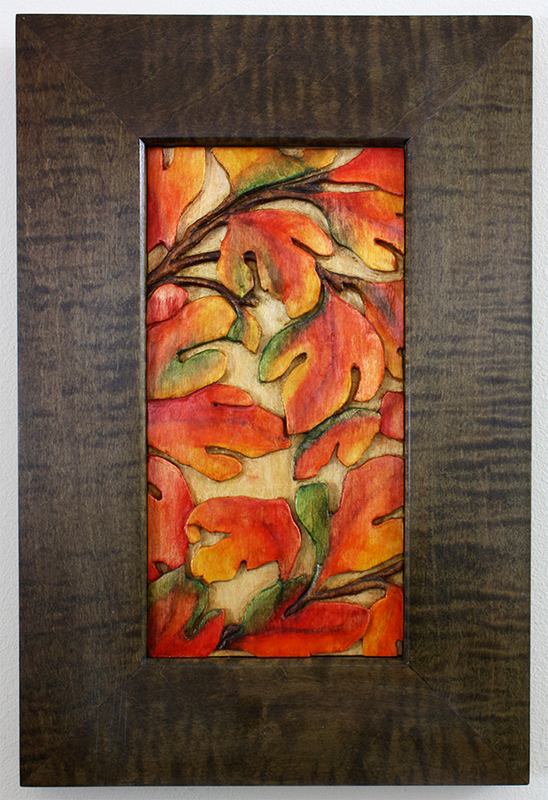 The carved panel measures 5″ x 10″, and the frame is 9-7/8″ x 14-3/4″. As with all my work I use some machinery for initial stock preparation but all of the carving, coloring and finishing is done by hand. These pieces are unique and I imagine there is a spot in your house that could use a reminder of a beautiful fall afternoon on a permanent basis. CLICK HERE TO VIEW MORE CARVINGS AND FURNITURE AVAILABLE FOR PURCHASE. I’ve been making stuff from wood for a long time, and you can view highlights of my work going back to the 1980s at this link.